U.S. 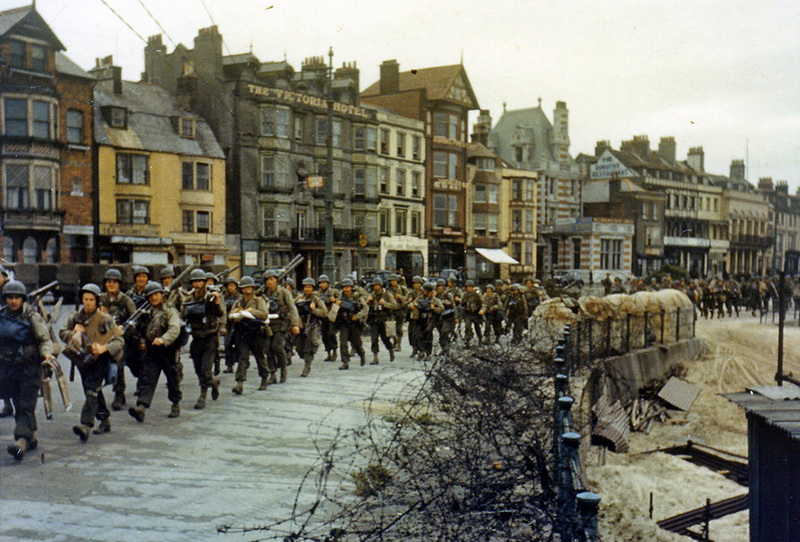 Soldiers march through a southern English coastal town, en route to board landing ships for the invasion of France, circa late May or early June 1944. Just a reminder, posting will continue to be quite light for at least the next two weeks. Two exams are this week, and the second will be spent on tying up loose ends here before I head back to America (insert sigh of relief here). – Debtors’ prison begins to make a return (via Global Guerrillas). – The size of a New York City block – the subunits of the grid – is rather bizarre compared to other major American cities. No Boston included on the chart though, it would have been nice to see a well-drawn blob. – ASCAP, the RIAA, and other titans of the music industry set their sights on a villainous group of dastardly ‘copyright infringers’: small coffeshops and library cafes. Because as usual, government is a tool to enforce the will of corporations. – San Francisco is getting an unprecedented event to beat even Fleet Week: the Russian guided missile cruiser Varyag (not to be confused with the now-Chinese aircraft carrier Varyag) and three ships of the Japanese MSDF will be paying a visit to San Francisco at the end of June. – Sean Wilkes takes over for Mike Slagh as editor at Secure Nation, and Alex Pedersen realizes that the only thing worse than a non-state actor detonating a nuclear weapon on American soil would be that group not detonating it on say, Pakistani soil. – If you haven’t seen it already, Jon Stewart had a great interview with Minnesota Governor Tim Pawlenty, who seems slightly more for real than I’d imagined. The whole three-part series is online now. – I posted two interesting pictures. This one compares the size of Chinese and other world cities, and this one is an amusing banner from McSweeney’s. It was a light week.